Sir Ernest Shackleton was a British Antarctic explorer who played an important role in the development of Australian Antarctic exploration, and helped Douglas Mawson fund the successful Australasian Antarctic Expedition of 1911. Born in Ireland in 1874, Shackleton went to sea in 1890, rising to the rank of captain. He was third officer on Captain Robert Scott's 1902 expedition to Antarctica, but became ill shortly after arrival and was invalided home in 1903. After returning to England, Shackleton became determined to lead his own expedition to reach the South Pole. After raising the necessary funds, he led the British Antarctic Expedition of 1907-09, with Captain England and first mate John King Davis. This voyage was unsuccessful for various reasons. Firstly, the expedition encountered serious financial trouble early in the voyage, and had to be bailed out by the Australian and New Zealand governments, with the support of Professor Edgeworth David of Sydney University. Shackleton invited David and his scientific protégé, Douglas Mawson, to join the Nimrod as a token of his appreciation. But more discouraging than the financial hiccup was the fact that the expedition didn't reach the South Pole. 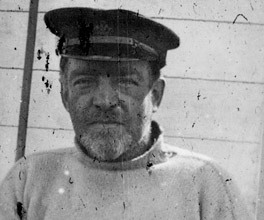 In addition, Captain England resigned after a dispute with Shackleton. His replacement, Captain Evans, also resigned, leaving John King Davis to command the Nimrod back to England. But Shackleton couldn't be deterred. In 1914 he launched an expedition to cross Antarctica. His ship was crushed in the ice, and although he managed to get his men to safety, they spent two Antarctic winters under upturned lifeboats. When the ice melted, Shackleton and five others left in a leaking boat to seek help on South Georgia Island. A rescue party in the Aurora was sent for the rest of the men in 1917. Shackleton, J & MacKenna, J 2003, Shackleton: an Irishman in Antarctica, Lilliput Press, Dublin. Primary sources like this one, written as events are actually taking place, often convey more drama and emotion that secondary sources can. Shackleton returned to the Antarctic in September 1921, but died of a heart attack in January 1922. Despite the disaster that seemed to follow him on all his expeditions, his contribution to Australia's Antarctic exploration is undisputed. A man with a genuine commitment to his science, Sir Douglas Mawson's name is synonymous with Antarctic exploration.